There's not a lot to say about All Saints, Debach (pronounced Debb'ch), despite the fact that it was completely rebuilt in 1854-56 to the designs of George Gilbert Scott. Our friend Phipson oversaw the work, but the designs for furnishings, window tracery and font were all Scott's. The increasingly significant carver Henry Ringham fulfilled some of Scott's design brief. The furnishings have all been dispersed now, although I understand the font remains. In the 1970s, this was one of several Suffolk churches sold off for secular residential use. In all honesty, it was better to lose this than nearby Boulge, Dallinghoo or Charsfield, and its conversion was less of a loss than that of Shipmeadow, Mickfield or Ubbeston, all medieval gems. 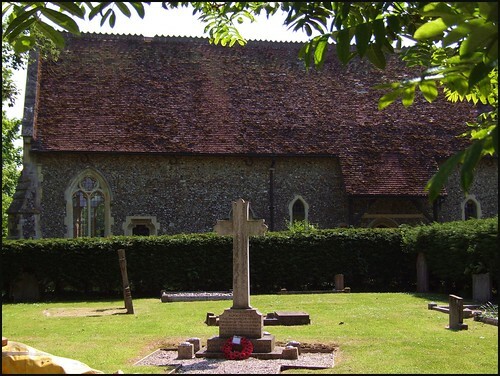 The village war memorial, and several graves, have been corralled by a hedge for public access, but the church and the rest of the graveyard are now private property. The former resident owners were friendly, and looked kindly on those tracing ancestors' graves, or even only interested in seeing where those ancestors worshipped. When they moved about five years ago, the church was put up for sale for in the region of £350,000. How anyone with that kind of money could resist such a bargain is beyond me. I'm not sure who lives there now.